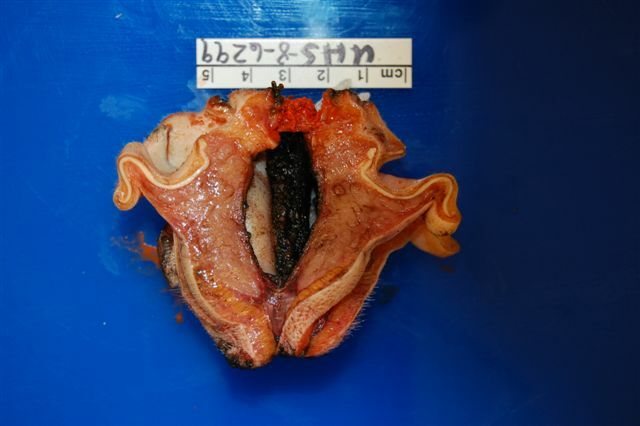 Thanks to Dr. Arthur Somoza, University of Cincinnati Medical Center, Ohio (USA), for contributing this case. To contribute a Case of the Week, follow the guidelines on our Case of the Week page. 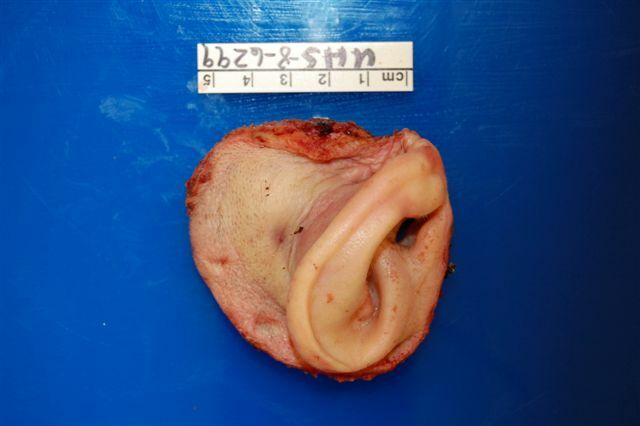 An elderly patient had a tumor behind the left ear. Eight years ago, he had a parotid tumor excised, with an unknown diagnosis. 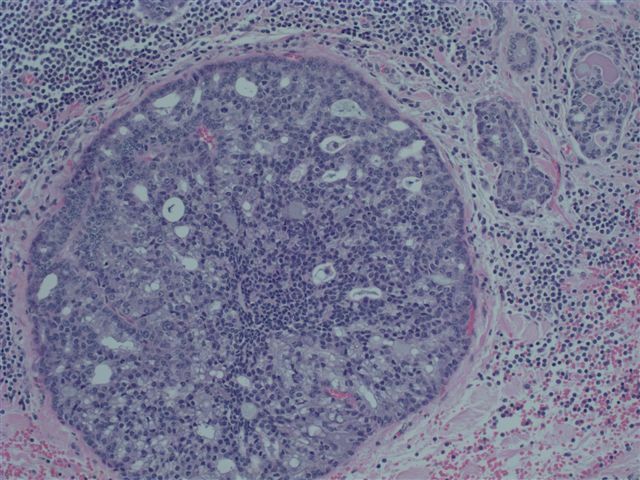 Review of the original slides showed similar histology as the current tumor. 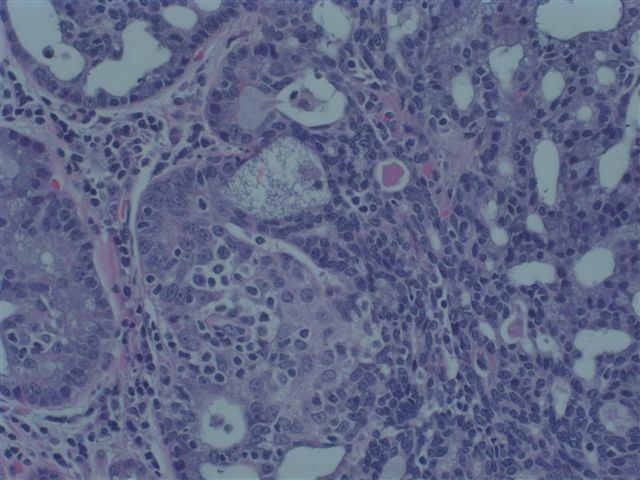 Acinic cell carcinoma is defined as a salivary gland tumor with acinar cell differentiation. It represents up to 10% of salivary gland tumors. It often presents in patients under age 50, and is more common in females through age 50, with equal gender frequencies at older ages (Cancer Epidemiol Biomarkers Prev 2009;18:2899). It usually affects the parotid and minor salivary glands, as well as parotid lymph nodes. Clinically, it is less aggressive than other salivary gland tumors. The tumors are typically encapsulated, 3 cm or less, tan-gray, solid or cystic. Only 3% are bilateral or multicentric. Most patients present with T1 or T2 disease. 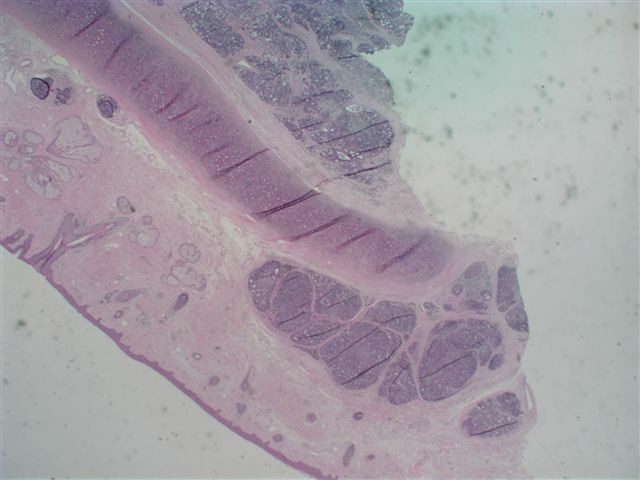 Histologic patterns are variable, including solid, microcystic, papillary/cystic or follicular. The typical tumor cell resembles the salivary serous cell with basophilic granular cytoplasm, but there may also be clear cells containing glycogen or mucin, vacuolated cells or smaller glandular cells. Mitotic figures are rare. 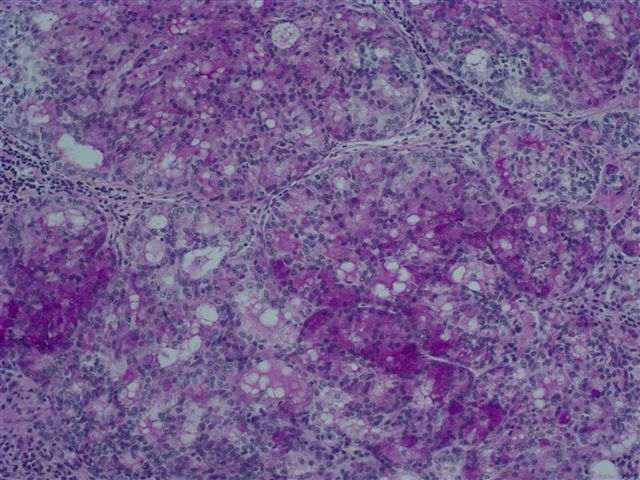 High grade transformation (previously called dedifferentiation) is rare, and has polymorphic cells with a high mitotic rate arranged in glandular and solid growth patterns with comedonecrosis (Am J Surg Pathol 2009;33:1137). Other rarely reported features are neuroendocrine differentiation (Head Neck Pathol 2009;3:163) and psammoma bodies (Acta Cytol 2009;53:440). Tumor cells are immunoreactive for serous cell markers, including keratin, alpha-1-antichymotrypsin and alpha amylase. The cytoplasmic granules are PAS+ diastase resistant. 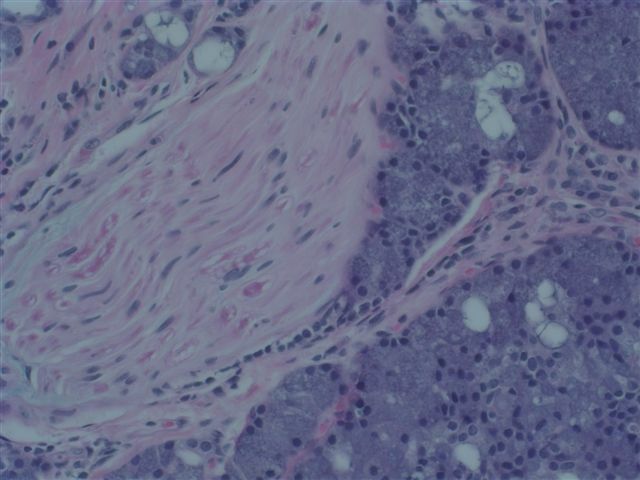 The differential diagnosis includes normal parotid tissue, which contains interlobular ducts and a lobular architecture, not found in acinar tumors. Treatment consists of surgical excision with negative margins, with possible radiation therapy or lymph node dissection. Patients have a five year overall survival of 90% (Cancer 2009;115:2128). Overall, 10-15% develop metastases, usually to local lymph nodes. Recurrence occurs in 10-30%, often due to inadequate excision. Additional poor prognostic factors include extracapsular extension, facial nerve sacrifice, lymph node involvement at presentation, and high grade features.